If culturally mature perspective involves being able to more consciously apply our toolmaking, meaning-making—creative—natures, then it must entail using our human intelligence in more consciously creative ways. In fact it requires that we rethink what we mean by intelligence, that we view intelligence in ways that more fully reflect the multiple ways we take in and organize experience. Creative Systems Theory emphasizes that human intelligence is more multifaceted than before we’ve been capable of appreciating. It goes on to describe how intelligence’s multiplicity is structured specifically to support and drive formative process, a notion that should not take us by surprise if our toolmaking natures is what most defines us. We can tie intelligence’s new picture with historical reflections. If one thing defined the Enlightenment picture, it was a new relationship to intelligence, indeed a new notion of what comprised intelligence. Enlightenment perspective was not just about stepping back and seeing more clearly. It joined rationality and awareness and made them one half of a new defining polarity—the objective set opposite the merely subjective. Cultural Maturity’s cognitive changes involve a necessary further step in this evolving relationship to intelligence. Like it or not, if our interest is the kind of “living” understanding future questions require, our intellects alone can’t get us where we need to go. Historically, bringing all of understanding into the light of reason propelled us forward in powerful ways. But reason alone limits us to engineering truths—wonderful for an Industrial Age, but not enough for today. As with Enlightenment perspective, a new relationship to intelligence lies at the heart of Cultural Maturity’s needed next chapter in understanding. In Chapter Four, we will look closely at the way Cultural Maturity’s cognitive changes invite us to step back and engage intelligence as a whole, with a newly systemic completeness. Creative Systems Theory has a mouthful term for the result. It calls Cultural Maturity’s more encompassing vantage an Integrative Meta-perspective. For now, the basic recognition that we need to better appreciate that intelligence has multiple aspects, each essential to who we are, will do. Culturally mature understanding and actions require that we bring to bear more aspects of intelligence—more of our diverse ways of knowing—than we’ve traditionally made use of at one time. Mature systemic perspective requires that we apply our intelligence in the rational sense—indeed that we do so with new precision. But it also necessarily engages other aspects of intelligence. Our recognition of the critical role that “bridging” polarities plays in new understanding helps makes the point: Culturally mature understanding consciously bridges facts with feelings, the workings of the imagination with more practical considerations, observations of the mind with things only our bodies can know. It requires that we consciously draw on the whole of ourselves as cognitive systems. We encounter something related with personal maturity. We associate the best of thinking in our later years not just with knowledge, but with wisdom. Knowledge can be articulated quite well by the intellect alone. Wisdom, however, requires a more fully embodied kind of intelligence, one that draws on all of who we are. Wisdom results not just because we better include all the aspects of our questions, but also because, when seeking answers, we don’t leave out essential parts of ourselves. We draw on all of ourselves as cognitive systems. If the concept of Cultural Maturity is correct, we should expect an analogous result at a species level, and it is essential that we do. The future will require something beyond just being smarter in the decisions we make. Given the magnitude of the choices we confront and the potential consequences if we chose poorly, it is essential that our decisions be not just intelligent, but wise. We could use a variety of multiple intelligence frameworks to bring detail to our thinking about cognition’s multiplicity, but Creative Systems Theory’s formulations serve our project in these pages in a particularly direct way. Creative Systems theory points out that our toolmaking nature means that human intelligence must at least powerfully support formative process. It goes on to describe how human intelligence is specifically structured to drive and facilitate creative change. Creative Systems Theory proposes that we are the uniquely creative creatures we are not just because we are conscious, but because of the particular ways the various aspects of our intelligence work, and the ways in which they interrelate. It describes how our various intelligences—or we might say sensibilities to better reflect all they encompass—relate in specifically creative ways. And it goes on to delineate how different ways of knowing, and different relationships between ways of knowing, predominate at specific times in any human change processes. It ties the underlying structures of intelligence to patterns we see in how human systems change—thereby both helping us better understand chance and hinting at the possibility that we might better predict change. Creative Systems Theory identifies four basic types of intelligence. For ease of conversation, I will refer to them here as the intelligences of the body, the imagination, the emotions, and the intellect. (CST used fancier language. )Creative Systems Theory proposes that these different ways of knowing represent not just diverse approaches to processing information, but that they are the windows through which we make sense of our worlds—and more than this, that they describe the formative tendencies that lead us to shape our worlds in the ways that we do. It also argues that our various intelligences, in the end, work together in ways that are not just collaborative, but specifically creative.Human intelligence is uniquely configured to support creative change. Our various modes of intelligence, juxtaposed like colors on a color wheel, function together as creativity’s mechanism. That wheel, like the wheel of a car or a Ferris wheel, is continually turning, continually in motion. The way the various facets of intelligence juxtapose makes change, and specifically purposeful change, inherent to our natures. —Before beginning to write, my sense of the book was murky at best. Creative processes begin in darkness. I was aware that I had ideas I wanted to communicate. But I had only the most beginning sense of just what ideas I wanted to include or how I wanted to address them. This is creativity’s “incubation” stage. The dominant intelligence here is the kinesthetic, body intelligence, if you will. It is like I am pregnant, but don’t yet know with quite what. What I do know takes the form of “inklings” and faint “glimmerings,” inner sensings. If I want to feed this part of the creative process, I do things that help me to be reflective and to connect in my body. I take a long walk in the woods, draw a warm bath, build a fire in the fireplace. —Generativity’s second stage propels the new thing created out of darkness into first light. I begin to have “ah-has”—my mind floods with notions about what I might express in the book and possible approaches for expression. Some of these first insights take the form of thoughts. Others manifest more as images or metaphors. In this “inspiration” stage, the dominant intelligence is the imaginal—that which most defines art, myth, and the let’s-pretend world of young children. The products of this period in the creative process may appear suddenly—Archimedes’s “eureka”—or they may come more subtly and gradually. It is this stage, and this part of our larger sensibility, that we tend to most traditionally associate with things creative. —The next stage leaves behind the realm of first possibilities and takes us into the world of manifest form. With the book, I try out specific structural approaches. And I get down to the hard work of writing, and revising—and writing and revising some more. This is creation’s “perspiration” stage. The dominant intelligence is different still, more emotional and visceral—the intelligence of heart and guts. It is here that we confront the hard work of finding the right approach and the most satisfying means of expression. We also confront limits to our skills and are challenged to push beyond them. The perspiration stage tends to bring a new moral commitment and emotional edginess. We must compassionately but unswervingly confront what we have created if it is to stand the test of time. —Generativity’s fourth stage is more concerned with detail and refinement. While the book’s basic form is established, much yet remains to do. Both the book’s ideas and how they are expressed need a more fine-toothed examination. 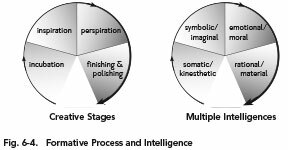 Rational intelligence orders this “finishing and polishing” stage. This period is more conscious and more concerned with aesthetic precision than the periods previous. It is also more concerned with audience and outcome. It brings final focus to the creative work, offers the clarity of thought and nuances of style needed for effective communication. —Creative expression is often placed in the world at this point. But a further stage—or more accurately, an additional series of stages—remains. It is as important as any of the others—and of particular significance with mature creative process. It varies greatly in length and intensity. Creative Systems Theory calls this further generative sequence Creative Integration. With the process of refinement complete, we can now step back from the work and appreciate it with new perspective. We become better able to recognize the relationship of one part to another. And we become more able to appreciate the relationship of the work to its creative contexts, to ourselves and to the time and place in which it was created. We might call creativity’s integrative stages the seasoning or ripening stages. Creative Integration forms a complement to the more differentiation-defined tasks of earlier stages—a second half to the creative process. Creative Integration is about learning to use our diverse ways of knowing more consciously together. It is about applying our intelligences in various combinations and balances as time and situation warrant, and about a growing ability not just to engage the work as a whole, but to draw on ourselves as a whole in relationship to it. As wholeness is where we started—before the disruptive birth of new creation—in a certain sense Creative Integration returns us to where we began. But because change that matters changes everything, this is a point of beginning that is new—it has not existed before. —The same bodily intelligence that orders creative “incubation” plays a particularly prominent role in the infant’s rhythmic world of movement, touch, and taste. The realities of early tribal cultures also draw deeply on body sensibilities. Truth in tribal societies is synonymous with the rhythms of nature and, through dance, song, story, and drumbeat, with the body of the tribe. —The same imaginal intelligence that we saw ordering creative “inspiration” takes prominence in the play-centered world of the young child. We also hear its voice with particular strength in early civilizations—such as in ancient Greece or Egypt, with the Incas and Aztecs in the Americas, or in the classical East—with their mythic pantheons and great symbolic tales. —The same emotional and moral intelligence that orders creative “perspiration” tends to occupy center stage in adolescence with its deepening passions and pivotal struggles for identity. It can be felt with particular strength also in the beliefs and values of the European Middle Ages, times marked by feudal struggle and ardent moral conviction (and, today, in places where struggle and conflict seem to beforever recurring). —The same rational intelligence that comes forward for the “finishing and polishing” tasks of creativity takes new prominence in young adulthood, as we strive to create our unique place in the world of adult expectations. This more refined and refining aspect of intelligence stepped to the fore culturally with the Renaissance and the Age of Reason and, in the West, has held sway into modern times. —Finally, and of particular pertinence to the concept of Cultural Maturity, the same more consciously integrative intelligence that we see in the “seasoning” stage of a creative act orders the unique developmental capacities—the wisdom—of a lifetime’s second half. We can also see this same more integrative relationship with intelligence just beneath the surface in our current cultural stage in the West in the advances that have transformed understanding through the last century. We associate the Age of Reason with Descartes’s assertion that “I think, therefore I am.” We could make a parallel assertion for each of these other cultural stages: “I am embodied, therefore I am”; “I imagine, therefore I am”; “I am a moral being, therefore I am”; and, if the concept of Cultural Maturity is accurate, “I understand maturely and systemically—with the whole of myself—therefore I am.” Cultural Maturity proposes that the discussion you have just read about intelligence’s creative workings has been possible because such consciously integrative dynamics are reordering how we think and perceive.